A new year inspires us to take stock on what was accomplished (or not) the previous year and allows us to dream about where the new year will take us. It’s another chance to get things right, to think of ways to do better and to correct mistakes of the past. The Montclair Let’s Grow grant was implemented in 2018 with the intent that community gardens would be made available to residents, workshops about how to grow, harvest, prepare and preserve produce would be provided, and bicycle repair stations would be installed at two sites popular with commuters and/or shoppers to encourage pedaling. The Montclair grant team accomplished much of what we set out to do, but we were not without our challenges. The Montclair Community Farm staff and Master Gardeners (specifically Chrystine Gaffney) are the stars in our show. Workshops were held monthly on topics ranging from container gardening, composting, seed saving, preserving your harvest and putting the garden to bed. Community garden beds and accompanying support were made available for folks who did not have the property or knowledge to grow fresh food on their own. Produce was sold through our Mobile Farm Stand to older adults at affordable prices and made available to Healthy Corner Store participants. People who gardened, attended the workshop, or received fresh produce were appreciative and gave positive feedback. However, we had some major setbacks. Imagine how frustrating it is to have 25 people register for a workshop and only three actually show up. And, even though progress has been made in our efforts to install the bike repair stations, they are still in boxes in our office. Our main focus in 2019 is making sure residents are aware of our efforts and increasing participation in the various programs. An exciting lineup of new monthly workshops is being promoted. We WILL have the bike repair stations installed, and plan on scheduling a ribbon cutting event and workshop to show folks how to use it. Just like those now dormant plants hunkered underground on this frigid day, we are poised to burst forth with renewed energy and purpose. Let’s Grow Montclair! We are ready for you. Montclair Community Farm's mission is to serve as a local hands on resource that engages and educates the community through urban farming, affordable food access and healthy living. At the heart of Montclair Community Farms is its coalition, partners and community volunteers. As our year ends, we noticed a few remarkable characteristics and challenges during our first set of programs. It seems while our “Let’s Grow Montclair” events are appreciated by our attendees, we’ve noticed that our attendance was significantly lower than our registrations. Our registration rates were exciting – even impressive. But come the day of the event, we had few participants. We delayed the presentations on numerable occasions. And we felt bad for the presenters who didn’t have the audience we had told them had registered. So what is the solution? We took pride in marketing these “generously grant funded, free programs” to a wide audience. We made sure the presenters were qualified, the topics were appropriate for the time of year, and the various locations were accessible to all. We sent out reminders the week before. Our attendance evaluations were all “excellent”. The best attended events were the ones where we were giving away items – or feeding those present. And even that wasn’t always enough to draw people to us. So as we reimagine our second year’s offerings we wonder if having a small attendance fee will encourage the participants to get to the event. Even a small payment makes people feel more committed. Another idea to increase participation is to schedule workshops around already established breaks. We will host this year’s workshops as “lunch and learn” events, allowing people to learn during lunchtimes during the work week, away from home and family responsibilities. Without an audience, we can’t spread our message to the community about how to adopt a healthier, more sustainable lifestyle. We have learned that these days, people do not often prioritize health. Our goal this year is to engage more community members in learning about healthy food and healthy lifestyles. As a Rutgers Master Gardener who gets to create and organize the workshops designed to improve the overall health of the community, I am so very grateful to work with New Jersey Healthy Communities Network and Partners for Health Foundation. We can't believe we get to be involved in these special projects through this wonderful grant which makes us overall, healthier, too! Donate before December 31 and receive a free book by local author Trina Paulus. Watch our video below and meet more of the residents and sites we serve. Donations are still needed, help us continue our impact in the community. Montclair Community Farms still needs donations to make our mobile stand possible. From now until December 31, every dollar you donate to the Montclair Community Farms will be matched 1:1 by Partners for Health. Your $25 donation helps feed our happy brood of chickens. A $50 donation helps us expand the varieties of produce we grow on the farm. A $100 donation supports better irrigation and compost systems. A $250 donation allows our staff to connect more often with volunteers. And a $500 donation helps bring our mobile stand to even more food pantries and seniors. Montclair Community Farms is a network of organizations, volunteers, Master Gardeners and Youth farmers that engage and educate the community in urban farming, healthy food choices and affordable food access through the mobile farm stand and other programs and services. Partners of Montclair Community Farms make it possible for our mission to succeed. The mission of Montclair Community Farms is to serve as a local hands-on resource that engages and educates the community through urban farming, affordable food access and healthy living. At the heart of Montclair Community Farms is its Coalition, partners, and community volunteers. Our partner at Montclair Community Food Co-op & CSA donate fruit and vegetable supplements to our farms from May to November, assuring an organic quality level produce to our mobile stand consumers, offering a wider variety of produce for the public. CSA coordinator and community member Gwen Charles works with our farms to continue our mission. Our mobile stand would not be possible without the support of organizations like the CSA. Read the CSA’s story below. Amy & Gerry from Hepworth Farms with MCFC Coordinator Gwen Charles. Montclair Community Food Co-op started as a small buying club on a porch in Montclair 15 years ago. As the buying club grew in membership and ambition, we started working with local farmers and partnering on a CSA we needed a space that embraced our goals of supporting local and organic farming. We are so pleased to host our bi-weekly summer farm share delivery on the beautiful historic property of the Montclair History Center and neighboring its project the Montclair Community Farms. 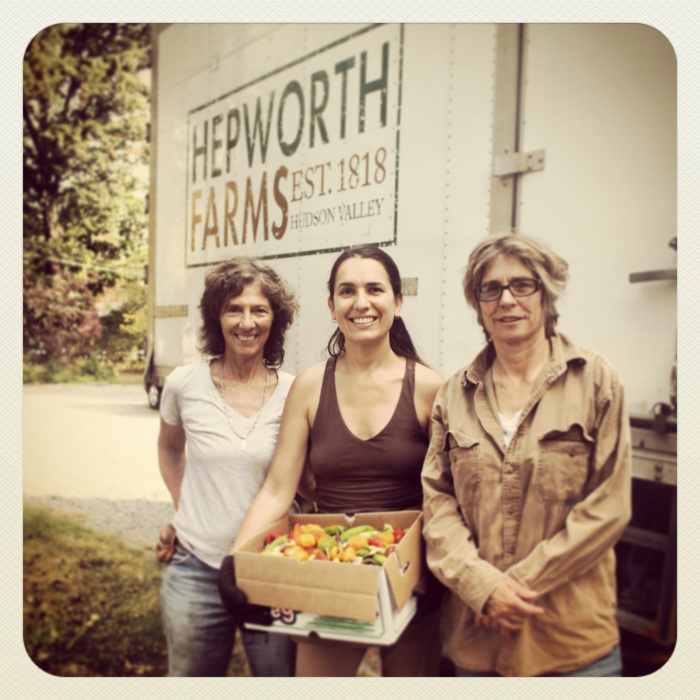 Montclair Community Food Co-op & CSA is proud to donate organic produce from family farm Hepworth Farms to The Montclair Community Farms and their mobile farm stand. Every two weeks we donate a full share of produce, a bushel box of beautiful seasonal produce for a family of four to the mobile farm stand to bring for sale to local seniors at a fair market value. CSA members also participate in volunteers days to help with the planting and harvesting of micro-farm property. Members enjoy visiting the chickens, bringing their organic food scraps for compost and visiting the grounds and attending community workshops. Montclair Community Farms needs donations to make our mobile stand possible From now until December 31, every dollar you donate to the Montclair Community Farms will be matched 1:1 by Partners for Health. Montclair Community Farms is only possible thanks to the support of the community and our generous donors. Your $25 donation helps feed our happy brood of chickens. A $50 donation helps us expand the varieties of produce we grow on the farm. A $100 donation supports better irrigation and compost systems. A $250 donation allows our staff to connect more often with volunteers. And a $500 donation helps bring our mobile stand to even more food pantries and seniors. "Supporting Montclair Community Farm, and their ongoing mission, provides a special opportunity to help families get back to the roots of healthy food and lifestyles, one carrot at a time,"
said Karen Lee who first came to Montclair Community Farms in 2013 when the farm site at the Montclair History Center property was still in its infancy. After Karen finished her coursework, she then became the Project Coordinator for Montclair Community Farms, expanding the engagement and education initiatives of the farms. Upon graduation, my continued interest in promoting local foods and the local food economy led me to an opportunity to have my own restaurant, a place for me to continue to influence and shape food choices. At Market Taverne, we actively seek to partner with local food producers and vendors to source foods and products to use in our restaurant. After Karen opened Market Taverne, she remained a connected community member to the farm and found ways to allow the farm stand to generate more income. One of the most popular selling items in the stand is the house-made granola by Chef Richard Huarte of Market Taverne. Creating local community partnerships at both the for-profit and non-profit level are very important to reconnecting families with health, promoting locally grown foods and a healthy food environment. Supporting Montclair Community Farms, and their ongoing mission, provides a special opportunity to help families get back to the roots of healthy food and lifestyles, one carrot at a time. Partnerships with businesses like Market Taverne allow the mobile stand to offer healthy value added products to our customers at an affordable price while generating income to offset maintenance costs for the farms. Montclair Community Farms depends on the support of community members to make our mobile stand possible From now until December 31, every dollar you donate to the Montclair Community Farms will be matched 1:1 by Partners for Health. Montclair Community Farms is only possible thanks to the support of the community and our generous donors. Your $25 donation helps feed our happy brood of chickens. A $50 donation helps us expand the varieties of produce we grow on the farm. A $100 donation supports better irrigation and compost systems. A $250 donation allows our staff to connect more often with volunteers. And a $500 donation helps bring our mobile stand to even more food pantries and seniors. said China Flowers, Program Director at First Montclair House. China has worked with Montclair Community Farms since the mobile stand began in 2016. China began her work at First Montclair house in 2011. As a child, China would visit her Aunt in Hackensack every summer, where she would take China and her sister to South Jersey farms and ride horses. China saw the value of local farms at a young age. “What is most rewarding to me about working for a non-profit is the appreciation and gratitude I get from my residents when we can make an issue a little less stressful for them or a little less expensive.” The mobile farm stand is known by seniors for its affordability. The stand directly serves seniors and populations and in the community in need of food access, delivering produce right to their doors well below the grocery store price tags. “One thing I love about the mobile farm is they come every single Friday, and no matter what they have, it’s always great, fresh vegetables. When you shop locally from a local farm you have better nutrients, it supports the local economy, the food tastes much better, and I literally eat for about $10 a week from farm to table.” Montclair Community Farms travels to numerous sites like First Montclair House during the growing season, not just to deliver produce, but building relationships with the seniors and staff at the sites we serve each year. From now until December 31, every dollar you donate to the Montclair Community Farms will be matched 1:1 by Partners for Health. Montclair Community Farms is only possible thanks to the support of the community and our generous donors. Your $25 donation helps feed our happy brood of chickens. A $50 donation helps us expand the varieties of produce we grow on the farm. A $100 donation supports better irrigation and compost systems. A $250 donation allows our staff to connect more often with volunteers. And a $500 donation helps bring our mobile stand to even more food pantries and seniors. Montclair’s Active Living Strategy plan is to install two Bike Repair Stations within the Township, one each year of the grant, to encourage folks to bicycle more. One of the locations is at a train station used by commuters to New York City, and the other at a parking deck adjacent to the shopping center surrounding Bloomfield Avenue. An ideal location in the parking deck was scoped out – plenty of room for the bike repair station to be installed, located safely across from the guard station, and no parking spots would be lost because of it. Preliminary approvals were obtained, the bike repair station was ordered in September, and it was shipped quickly. We formed a partnership with Cyndi Steiner, Executive Director of NJ Bike and Walk Coalition, who offered to donate three vertical bike racks which could also be installed at the site. Everything was going along smoothly….until…everything grinds to a screeching halt. WHY are we not able to find somebody who is willing to install the bike repair station and vertical bike racks? WHY do the people who have installed them in other locations refuse to answer our emails and return phone calls? WHY is there now a question as to whether or not the space we have selected in the parking deck is even going to be available, or is it now the home of a new street sweeper? WHY will the company who is supposed to print the recognition plaque ignoring me? I will stay positive – tis the season after all – and keep plugging away to get this done. Meanwhile, enjoy our photo of Lana Mustafa, Farm Manager for Montclair Community Farms, showing off some beautiful produce in our Mobile Farm Stand! The Montclair Department of Health and Human Services services Montclair, Cedar Grove, Verona and Nutley. Our mission is "To protect and enhance the health and quality of life of Montclair residents through preventative activities, coordination of interagency efforts, and interventions designed to promote positive health behaviors. Like other campers who want to stay connected to the farms as they get older, Colleen’s daughter became a counselor in training, now a mentor to many youth who are experiencing camp for the first time. “She feels accepted, supported and safe there. She has been able to engage with animals and nature in a beautiful setting that is close to home.” Farm camp is a way for youth to learn about our modern and agricultural past. Youth leave camp understanding the the importance of community and who the farm stand serves each week in summer. Montclair Community Farms has become more than just a place to buy fresh and affordable produce, it has become a place for seniors, youth and the community to connect in many formats, including that of the annual summer camp. For 14 year old Caroline Prentince of Montclair Fusion Academy, this was her first summer spending hours in our Urban Youth Farmer program. Beyond learning how to plan and harvest vegetables, or care for chickens, Caroline learned the meaning of the mobile farm stand to the community, Read her story below and learn why she dedicated her summer at the farm this year. I walk up to the gate and get greeted by the chickens making a racket. The chicken coup and the beds are filled with amazing produce, ready to be picked--eggplant, herbs, green beans, peppers, lettuce, even flowers, and so much more is all around. The smell of wonderful herbs like oregano, mint, basil, and lemon balm helps with the smell from the clean chicken coup. Sometimes there are even chickens running about, helping eat weeds. Volunteering at Montclair Community Farms (MCF), as a youth farmer, has been an amazing experience. I have been a youth farmer for them since June 2018. I love helping with the chickens, harvesting, watering, and so much more. I love getting in the dirt and doing whatever I can to help. I also help sell at local senior centers. I hear about their daily life, and they ask me questions about mine. This makes me be a part of my community. A fun holiday event I was part of at MCF was the 4th of July parade, where we threw candy and gave out business cards. I was so delighted that I pushed through and gave out cards for the entire parade. That was my first time being in a parade! I saw so many members of my community there and cheering me on. I helped sell the produce every week that I could. I was there every week, unless I was on vacation. I am so happy that I helped the community and brought seniors fresh food for a small price. I remember one day on farm stand when one woman bought $13 worth of produce;she left with about four bags! She bought that much because all of our produce costs two dollars or less, which is amazing! I love the leadership skills I get from volunteering at Montclair Community Farms. I learned how to help other volunteers know what to do. I showed them where everything is when we had new volunteers. The people who run the farm also trusted me enough to let me do that when I had only been there for a few months. MCF keeps me happy by giving me fun stories to tell. I remember one time when I was helping sell to a senior center, and we had sour cherries. Nobody was buying them, until one lady came by. She bought all of our cherries--two and half buckets! She was the first to buy them, and she took them all! She was surprised to see sour cherries because you can’t find them that often. I think she was going to cook them and make a jam or preserve. Being at Montclair Community farms has helped me grow in so many ways. It has helped me get down in the dirt and get messy. I learned people skills and leadership skills. It gives me a purpose. It keeps me be busy and it gets me outside. Most of all, it has helped me reconnect with nature rather than being on electronics constantly. I look forward to continuing my volunteer work there. "Not only do I see community building here, I see people engaging with one another, but then I also see people learning what it means to live a healthy lifestyle,"
said Monique Perry, a Master Gardener of Rutgers Cooperative Extension of Essex County who completed her 80 hour requirements and beyond at Montclair Community Farms this past year. Montclair Community Farms is fueled by a network of volunteers who dedicate their time to make sure the farms and mobile stand are a success each year. Monique reflects on the importance of community, “It’s really important to me, and some of the people I see, I know them, that always warms me, I feel so great to be here.” Monique grew up on Elmwood Avenue in Montclair, a neighbor to our farm on HOMECorp property at 16 Miller Street. Monique continues to volunteer her time working on the farm, leading and educating other volunteers, and delivering produce to seniors in the community. Montclair Community Farms is a space to learn and give back for the volunteers who connect with us. Listen to Monique’s video story and learn more about her experience with the farm and mobile stand. From now until December 31, every dollar you donate to the Montclair Community Farms will be matched 1:1 by Partners for Health. Montclair Community Farms is only possible thanks to the support of the community and our generous donors. We depend on your donations to support our farms that grow our food, our staff who teach and connect with volunteers, and the mobile farm stand that delivers fresh, local and affordable produce to food pantries and senior housing in our neighborhoods. said senior Grange Lady Haig Rutan, one of our weekly senior shoppers at Montclair Community Farms (MCF) mobile farm stand. Every week during the growing season, the MCF mobile farm stand travels to senior centers and other locations in Montclair and the surrounding community to provide the community with fresh, local and affordable produce, which they otherwise might not have access to. But the farm stand has become more than just a place to buy fresh and affordable produce, it has become a place for seniors, youth and the community to connect. Dear Lovely Mother of three. Dear Produce Manager of the Crane House. Dear Lana on train that is passing by....I mean a darling little house on wheels as if from a fantasy. Dear VIP and Friend to Our Youth who aid and abet you on this journey to First Montclair House. Dear Precious Person. I feel I know you. Not through the written word but through your smile and the wonder you create among us with your arrival of produce each and every Friday at 1:30 p.m. You are more reliable than the Erie Railroad. I must say that you bring such joy, not just to me, but to all of US. I collectively want to thank you. All too often words are left unsaid, not so in this instance. We will be sad when in two weeks we will be a faded memory and, once again, worry about eating healthy and with fresh and wonderful vegetables...but that's not your problem. You, yes you, and those lovely smiling helpers, have brought a new dimension to the start of our weekend. I feel young again when I take my package up to my home. I dare to go into the kitchen and remember the joy of cleaning vegetables from The Good Earth. Savory mint, juicy tomatoes, rabbit-loving lettuce and whatever else you surprise US with. The bottom line is you are apart of yesterday's dreams. When the world was young and so was I we didn't have YOU and Your Team. We were out dreaming dreams. However, when I was in the fifth grade, right across the street at Grove Street School, we had a Victory Garden and got out of class to til the earth, to plant seeds and watch it grow over time. I can appreciate who you are. Sadly, this very morning, I gave the Bee Magazine away so it will just be US that will come next Friday. Thank you for loving what you do. I Salute You! And My Love For You Runs Deep! Several of the seven stores participating in the Township’s “Montclair Shop Healthy “(MSH) corner store project offered locally grown vegetables from Montclair Community Farms to their customers this season, thanks to the “Let’s Grow Montclair” grant project. Montclair Community Farms donated a portion of their harvest to MSH participating stores Grove Convenience, Quick Pick, Krauszers Food Store, and Jack’s Store, to encourage customers to try locally grown vegetables and to connect corner store owners with distributors of locally grown produce. Nancy, the amazing storeowner of Jack’s Store on North Fullerton Avenue, was eager to offer free locally grown tomatoes, white eggplants and peppers to her customers in need. Patel Paresh (P.K), the dedicated owner of Krauszers Food Store at Valley Road, gave away potatoes, cucumbers, onions, squash, peppers, and tomatoes to his customers. He also requested produce for his other store; Quick Pick on Harrison Avenue. In an attempt to encourage store owners to sell locally grown produce, there were some challenges. For example, Manan, owner of Montclair Food and Fuel, believed that vegetables would not sell in his store and did not want to accept the produce that was offered. On the other hand, Alpana, the owner of Grove Convenience, was happy at first to supply her store with locally grown produce, but because the ripe farm fresh tomatoes, peppers, and eggplants began attracting flies, she decided to hold off from selling vegetables at her store until she gets a refrigerator for her produce. At the end of the day, it is the customers that must, in some way, persuade and influence store owners to sell fresh, locally grown produce. By expressing their desire to purchase fresh and locally grown products, the store owners will be more motivated and excited to switch from their current produce to better options. As a Health Educator and the Montclair Shop Healthy project coordinator, Ivana Drazin Ivelja is happy to encourage, suggest and advocate for a culture of health in the Montclair Community. Once upon a time there was a Pathmark in Montclair, NJ. Many people who didn’t have cars went there to get their food because it was soooo centrally located and affordable for everyone! Then one day the Pathmark closed. Much unrest ensued and as much as they tried, many people tried to get another food store of some kind to be inserted into the same location. Or a farmer’s market? Something to keep good nutrition present in that area. Sure, the city set up bus services to local food stores – but the further stores were more expensive – by a lot. The efforts were not enough and so many felt there was now a food desert in that area. It just wasn’t the same. Enter Montclair Community Farms Coalition and 4-H clubs in the area. The coalition researched the problem and saw how it rippled outward to other areas of Montclair. They were growing fresh vegetables and wanted to sell them at low cost to the people affected by the lack of the Pathmark. Through grant funding, they obtained not only a Mobile Farm Stand, a pickup truck to pull the Mobile Farm Stand, a refrigerator to keep extra vegetables fresh for the next farm stand trip, but also a big hoop house so they wouldn’t have to buy the seedlings in the springtime but instead start them from seed themselves in the winter months. Now they have a NJ Healthy Communities Grant that further enables them to easily bring vegetables to the small convenience stores to share with their customers around Montclair. Now all year long they can educate the community about how nutritious food can happen healthier and more sustainably through workshops. The generosity of the NJ Healthy Communities Grant enables these efforts to ripple out through Montclair and fill the needs of the community – one tomato at a time. The journey of good health begins with a single seed. We all hope our NJHCN grant programs encourage a paradigm shift in our audience, to nudge them closer to healthy living & show them a different, better way of life. So when I found myself thinking a different way after viewing Deeply Rooted by the Slow Foods organization, unable to sleep, seeing new connections in our lives, I only hope the experience was as deeply felt by the participants as it was by me. John Coykendall’s “journey to save our seeds and our stories” was more than a documentary about seed saving. The history of his county and his artwork were key in telling those stories as well as the people who know him. His seeds were started by folks who are no longer with us. The stories he keeps in his notebooks remind us where we come from. Why are Seed Banks and Seed Saving so important? From one fluffy seed pod of an arugula sprig, a whole bed of lettuce can be harvested the following spring. From one overly-ripe tomato, if saved correctly – several rows of tomatoes can be harvested the next year. In a few months we will be starting a seed bank with 4-H at Montclair Community Farms. We have a refrigerator to store the seeds in envelopes and plastic bags. On October 27th we’ll show where seeds are kept inside the fruit and vegetables, then next winter the seeds will be available for anyone to come and take a garden’s worth of seeds to watch the magic unfold for themselves. Our January workshop will be about planning the garden so we can help the community figure out their challenges. In February they can start their seeds early in our hoop house or enjoy watching them sprout on their windowsills as the snows fall. We so grateful to be part of this grant because it allows us to be this passionate about helping our community to lead healthier lives and giving them good resources to do so. As the Master Gardener in charge of creating and organizing the programs and activities that are designed to improve the overall health of the community, I am so very grateful to work with New Jersey Healthy Communities Network and Partners for Health Foundation. We can't believe we get to be involved in these special projects through this wonderful grant which makes us overall, healthier, too! My father, and my grandfather before him, always had a vegetable garden. Working the soil with your bare hands, impatiently watching veggies grow, picking that first red tomato warmed by the sun (and eating it out in the yard), were pleasures passed down through the generations in my family. However, many people who would like to garden face challenges – either physical, due to aging bodies, or for sheer lack of space to plant a garden. Enter the Earth Box! Master Gardener Chrystine Gaffney of Montclair Community Farms instructed a group of residents in how to plant and grow two types of tomatoes, parsley and chrysanthemums in a manageable container garden. A family trio – Louella Dudley, her daughter Mariama and grandson Zephon planted earth boxes together, reminding us that the joy of learning to grow your own produce can and should span generations. My dad fell in the fall and has been suffering with lingering medical complications for several months. I built my “test” Earth Box with his limitations in mind. I am happy to report that it now sits on his deck and has already produced a ripe tomato, which actually made it into a salad, still warm from the sun. As Director of the Montclair Dept. of Health and Human Services, I oversee programs and activities that, for the most part, are mandated by the NJ Department of Health. New Jersey Healthy Communities Network and Partners for Health Foundation enables us to become involved in these special projects, designed to improve the overall health of the community, and help make our jobs more fun!